It seems that animals both big & small provide happy thoughts on Monday mornings … and this Monday is no different. I absolutely love the homage to the humble sheep in the form of Purl Bee’s latest project the Bobble Sheep Pillow, especially the brilliant bobble stitch which I think would knit up into a fantastic blanket. The pattern calls for Purl’s signature bulky, but I’m thinking slightly finer Country Wide on 7mm needles would work up beautifully, with some Classic Bluebell in Black for the face & feet. To celebrate Wool Week last year, MillaMia whipped up a flock of little Milly’s which visited our shop looking all cute and cuddly – they are the perfect size for tucking into a bed to keep little ones company … everything you need for your own Milly is available here. I have always admired Kate Davis’s Rams & Yowes blanket, one day I might even attempt this amazing blanket – it has been one of my favourites for a long time. 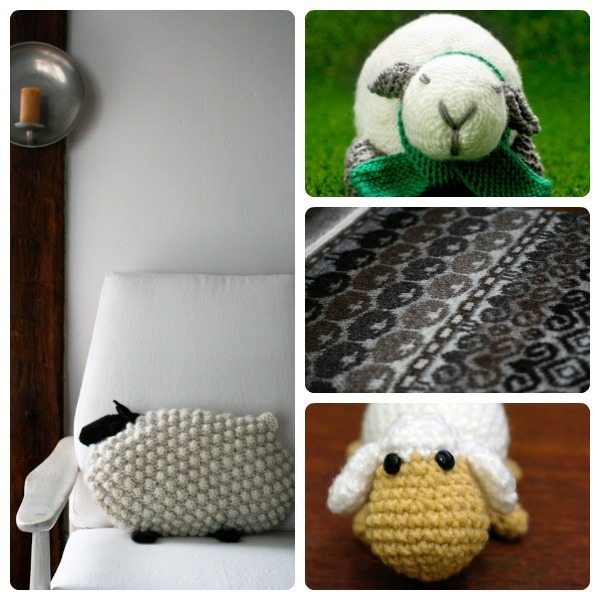 And for those of us that crochet, Elin Thum’s “Silvia” just makes me smile … how cute are those little black eyes and floppy ears? ?